I received a letter today from Rt Hon Nick Gibb (Minister of State for School Standards). 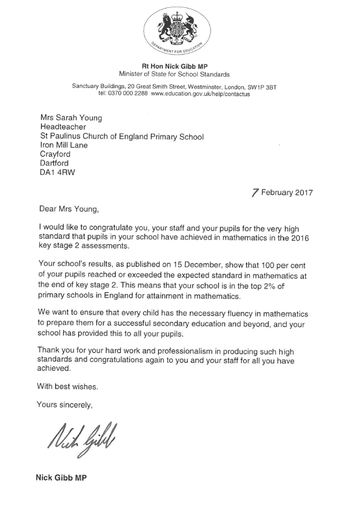 He wanted to congratulate us for our excellent Maths results in the KS2 SATs last year - 100% of our children reached the expected standard in Mathematics which means that our school is in the top 2% of primary schools in England for attainment in mathematics. What a fantastic achievement! We are all very proud of the children's achievements and of the hard work our teachers do.